Plot Summary: Young biker Takumi Inui trails a girl named Mari Sonoda, whom he suspects has his stolen gym bag. When he encounters Mari, he finds out that the bag she carries is not his and that she possesses some top-secret items developed by the Smart Brain Corporation. He also discovers that she's being hunted down by Orphnochs - enhanced humanoid beings sent by Smart Brain to recover the items. 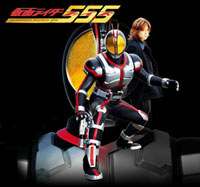 Takumi reluctantly uses two of the items - a cell phone and a belt - and becomes Kamen Rider Faiz to combat the Orphnoch threat. #2: "The People With No Name" by m.c.A.T.